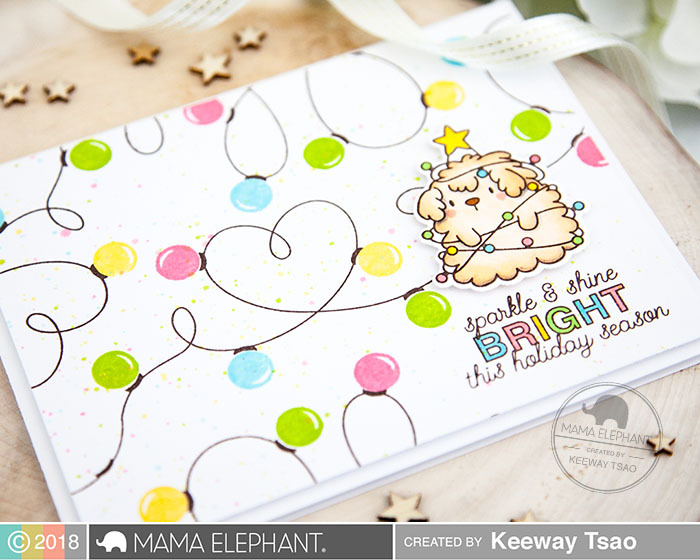 Today’s Mama Elephant Stamp Highlight features the stamp set Bright Lights. 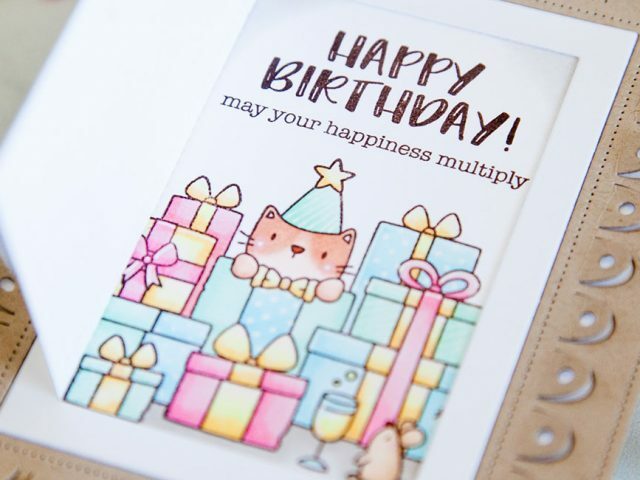 This is a fun set that makes a really great CAS (clean and simple) card, and makes a really fun stamped background. 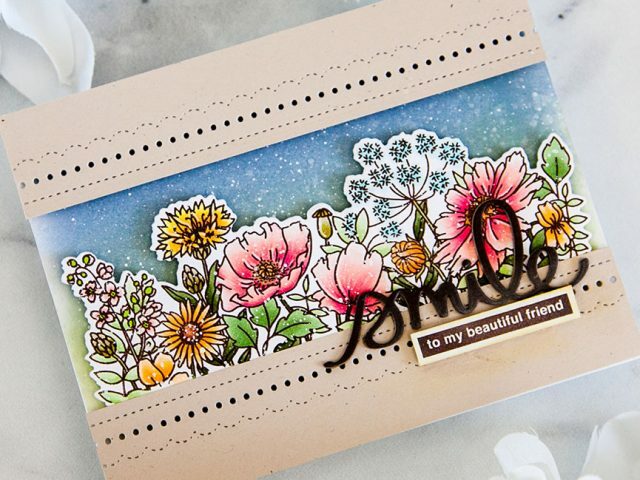 I pulled out 4 colors to alternate stamping with and was ready to get this card started! I started by stamping the string that is wound up in a shape of a heart with dark brown hybrid ink, centered. Then I used the other stamp to connect the ends of the string until it stretches off the width of the card. I used both stamps multiple times to fill up the rest of the card, being cautious to leave room for the light bulbs later. I picked out 4 colors to work with: Parrot, Ocean Waves, Coral Berry, and Warm Sunshine. I alternated the colors making as I filled in all the spots for the bulbs. Then, used the same inks to add splatter to the card. I left a space in the bottom right corner for my sentiment. The focus word ‘BRIGHT’ had room for coloring so I had imitated my four color combo in the letters. I also stamped the fluffy dog entangled in holiday lights from Yappy Woofmas in dark brown ink and colored him with copic markers with the same color scheme. I added him above the sentiment with foam tape. In addition to the front of the card, I decided to include a spot for a surprise gift card. I used the Card Holder CC to create this pop-up “bag”. 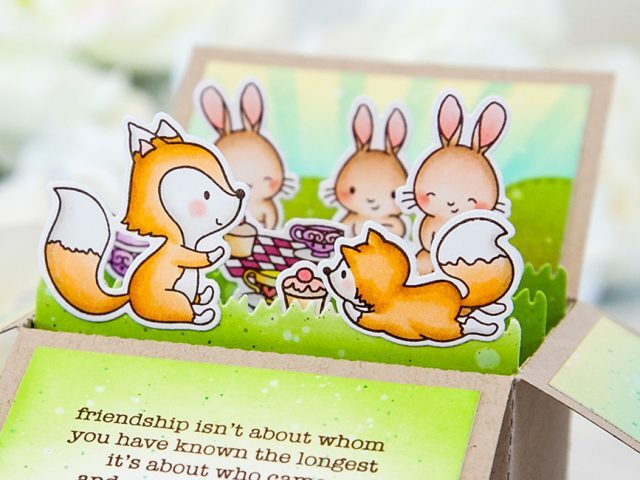 To create this, you need to cut large die twice, have the inside face each other and adhere the tabs. I used a double sided adhesive to assist me here. I also die cut a few handles, and on one of the handles, I created a mini tag using Scallop Tags Trio and decorated it with images from Holiday Bitties. I tied it to the handle with EMC thread to minimize bulk. And the last step is to adhere the long strips down to the card. I’m excited to be using this die a lot as everyone always put gift cards on their wishlist now, and I’ll be able to combo my handmade care with the gift on the inside!